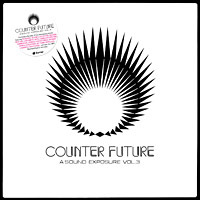 Counter Future is the third release in Equinox Records’ Sound Exposure compilation series, which debuted back in 2004. This album also marks the 50th release on the label and acts as the 10th anniversary compilation, making it a truly special and momentous affair. “I wanted the selection to sound timeless yet still have a modern, futuristic vibe”, says label founder and compiler Günter Stöppel aka DJ Scientist. The first release in the Sound Exposure series, Welcome to the Neo Golden Age, defined the dual organic/electronic sound that the label has come to be known for. With this latest instalment of the series Scientist wants to set another important landmark for the label’s growing catalogue. Counter Future is far from just a simple label sampler, composed almost entirely of exclusive tracks from the label’s roster and its extended, worldwide family. It is a coherent and unique album that showcases the broad spectrum and various facets of today’s electronic and beat scenes. Across 21 tracks from 17 different artists Counter Future is the most extensive and complete release on the label yet: you’ll find acclaimed French producer Fulgeance alongside long term Equinox artists such as 2econd Class Citizen and Deckard as well as close affiliates and friends including Los Angeles’ Dday One and Glen Porter. Each artist contribute their own unique musical mark to this anniversary release. The compilation opens with the epic, film score-like introduction by producer and bassist Geste. It is followed by one of the label’s latest signings, Italy’s Godblesscomputers with his track Romania. Next is the turn of Greek producer Andreikelos and his Beautiful Mountain of Algos, a powerful downbeat and melodic composition. Germany’s Skyence contributes the haunting, neo space age electronica of Scars while Finest Ego Beat Championship winner Playpad Circus brings the splendid Megalomaniac. Fulgeance provides the epic Cypher with his trademark swing and bounce, Anthony Drawn teams up with Graciellita from L.A. on the stunning Lighthouse. 2econd Class Citizen then rediscovers his love for folk, hip-hop and uplifting but melancholic strings on I That I Am and Haunted Days & Witch’s Teat as well as Glen Porter provide their dose of instrumental hip-hop, uncompromising beats and guitar riffs which act as the perfect counter weight to the more electronic sounds on the album. Counter Future is roughly divided into two parts with another Geste track, Exhale (Intermission), acting as the divider. Following this, come the vigorous Kill Ya Sound by L.A. producer Gone Beyond, Bit-Tuner’s bass heavy Getaway and Kopfklang’s Piet Mann 4, a very interesting composition from the upcoming Berlin producer. Next up, Deckard provides a stunning composition with St. Ella, while 2econd Class Citizen re-appears with another exclusive track, On Emptiness, originally released on his classic 2009 album A World Without. This new version reworks the original with added piano by Kevin Matthews. Underground L.A legend Dday One supplies Anechoic Chamber, J. Baracuz delivers Before The Storm, Andreikelos teams up with Bombers Of Consciousness and Kopfklang provides his second track Ave Mensch, a darker production that is followed by Canada’s David Vangel’s I Heard You Sing, the last track of the album. The song closes the compilation with beautiful choruses and vocals, accompanied with the kind of soulful drumming Vangel has made his trademark. Despite its length Counter Future remains a cohesive listen and manages to once again showcase the amalgamation of sounds and styles that the label has become known and loved for. All of which makes it an essential album for fans of Equinox Records both old and new.